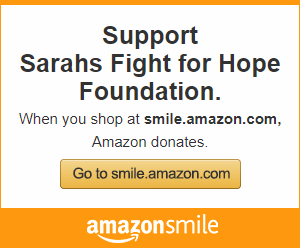 Sarah's Fight for HOPE serves families who reside in New Jersey, with a child (newborn through age 19) who has been diagnosed with and is actively in treatment for cancer or another life-threatening illness. We understand first hand how acts of kindness, the spirit of giving and life’s simplest gestures can positively impact families. One of Sarah’s favorite things...SPA Day for teen girls 13-19 actively in treatment. Enjoy some pampering with a manicure, pedicure, mini facial or massage. This service can be provided local to you or in the hospital during an admission as a pick me up. Your choice. ​We strive to make magical memories for children celebrating a birthday while inpatient giving them the gift of a normal childhood experience which so often is stolen from them. They will enjoy balloons, a cake and gifts that will be sure to put a smile on their face. ​A special package of customized gifts to newly diagnosed children age 0-19. Delivered to you by Sarah's PALS. We strive to brighten their day with a smile and provide HOPE. We also include financial support to help offset cost of meals, gas and parking while child is in treatment. ​Families dependent on two incomes or single parent families are likely to experience financial difficulties if a parent must quit their job to care for their child. We can help defray the cost of basic living expenses when there is loss of income from work disruptions directly resulting from a child’s illness. Every parent’s worst nightmare. This is an unplanned expense which we understand too well. We compassionately assist bereaved parents with the financial expense they face in making final arrangements. We offer an easy way to share your Hero's story and raise awareness about pediatric and adolescent cancer. This is also be an opportunity to raise funds to support valuable programs and research. It can be as simple as an ongoing way for friends and family to donate to honor a loved one.